Description: Large creamy white flowers are decorated with bright raspberry red feathering, bringing fresh new energy to the late spring garden. Elegant blooms are gracefully carried on strong stems 20-22” long, making them ideal for luscious indoor arrangements, too. 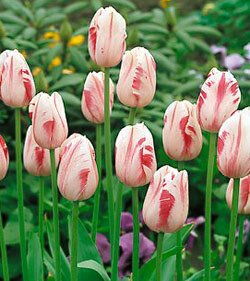 Dazzling in the mid-border, drifts of this popular tulip will be the envy of the neighborhood, mixed with early summer perennials.